San Diego leaders rushed to implement a flurry of short-term solutions to a growing homelessness problem in 2017. Here’s what to watch in 2018. It’s now a foregone conclusion among San Diego leaders facing a massive homelessness crisis: San Diego needs more housing to solve the problem. The question is whether 2018 will be the year regional leaders who in recent months rushed to implement short-term solutions can marshal support for long-term ones. Months before the November 2018 election, there’s talk of a handful of ballot-box solutions to pull in more money for homeless housing and services. City politicians, state lawmakers and county officials are also hashing out their plans for the new year. 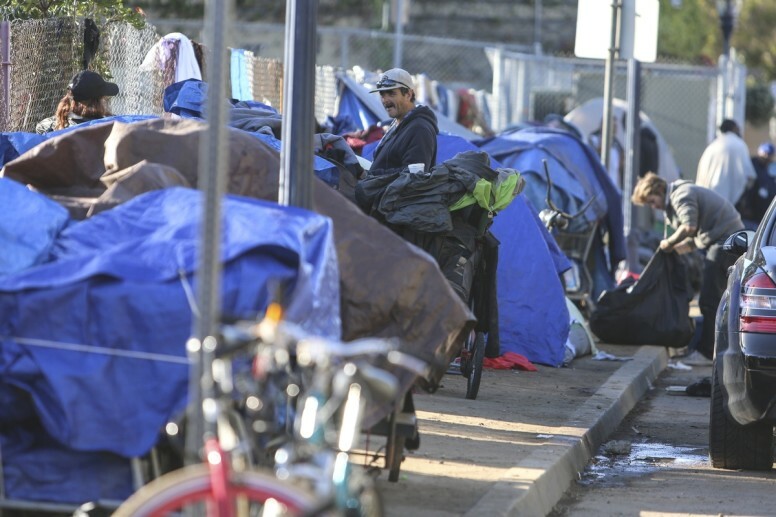 They’re promising not to lose focus on the permanent resources that’ll be necessary to address the growing homeless problem that helped fuel a deadly hepatitis A outbreak. Here’s a rundown of what to watch for in 2018. Expect homelessness measures on your ballot this fall. One’s already a sure thing. State lawmakers in September voted to place a $3 billion bond measure on the November ballot. If approved, it’s expected to pay for more than 20,000 new homes statewide. San Diego-specific efforts are still coming together. City Councilman David Alvarez has proposed a city charter amendment to invest all growth in hotel-tax revenue over the next 20 years to homeless services and housing. He’s set to offer more details on his pitch at a Jan. 10 City Council committee hearing. Business and labor groups are eyeing their own hotel tax plans. They’re negotiating a potential hotel-tax hike that would bankroll a Convention Center expansion and give the city more cash for homeless services and road repair projects. A similar measure pushed by Mayor Kevin Faulconer last year crumbled in part due to unions’ concerns it didn’t do enough to address homelessness. It’s not yet clear whether the new measure would dedicate more to homelessness – or when the group may share its plans. Backers of a third ballot measure have also been working behind the scenes to line up support. Early this year, the affordable housing lobbying group San Diego Housing Federation is set to propose a property-tax increase to subsidize at least 7,500 new homes for homeless San Diegans, veterans, seniors, low-income families and people with disabilities. Other California counties approved similar measures in 2016. Stephen Russell, who leads the Housing Federation, plans to present the likely $900 million bond measure to a City Council committee in February in hopes the Council will eventually place it on the ballot. A fourth local group is also weighing its options. Businessmen George Mullen and Brian Caster, whose initial pitch to erect a homeless tent in Otay Mesa won support from several powerful San Diego businessmen, say they are considering a countywide 1/8 cent sales-tax for temporary and permanent housing for San Diego’s homeless. Mullen said his group expects to decide whether to move forward within the next couple months. As homelessness has surged, so have questions about whether San Diego has a large-scale plan to address it. Efforts are under way, though they’re on few San Diegans’ radars. A key leader even admits there’s a need for far more help. The Regional Task Force on the Homeless, a countywide group that aims to coordinate responses to the problem, this summer received outside guidance on steps the region could take to better align its homeless-serving approach and get more San Diegans off the street. The Task Force also hired Gordon Walker, a leader who had success reducing chronic homelessness in Utah. He’s now spreading the word about the regional strategy and trying to help San Diego’s homeless-serving organizations operate as a system to better address the cause. Faulconer and individual City Councilmembers last year pushed housing plans they believe could help encourage developers to build more housing for both middle-income and low-income San Diegans. Faulconer expects some of those reforms to move forward early this year. The San Diego Housing Commission is also looking at potential tweaks to force developers to build more affordable rental units, following a request from City Councilman Chris Ward. The Commission has focused specifically on homeless San Diegans with a three-year, $80 million plan to move 3,000 people off the street. As part of that plan, a program that incentivizes landlords to rent to homeless veterans has been expanded to apply to all homeless San Diegans working with the commission. A spokesman said the agency also quickly ramped up a program to help San Diegans who are at risk of homelessness. The Housing Commission also expects to build at least 500 new affordable housing units over the next few years. But Housing Commission CEO Rick Gentry hasn’t been shy about saying that his agency can’t keep up with growing homelessness with the resources it already has, even as it throws more of them at the problem. At a forum last month, Gentry suggested San Diegans consider the housing bond the Housing Federation’s working on. State Sen. Toni Atkins, who’s championed housing issues throughout her career, is taking the Senate’s top leadership post this year – but she’s yet to discuss major housing legislation for 2018. Other San Diego legislators are weighing more incremental options for 2018. Assemblyman Brian Maienschein is mulling a bill that would ensure families who seek temporary housing assistance from the state on multiple occasions can more easily access that help when they’re not seeking it on consecutive days. A spokesman for Assemblyman Todd Gloria said he’s considering legislation to stimulate more housing units of differing sizes and looking into whether there are unused state properties, including in San Diego, that could be future housing sites. Assemblywoman Lorena Gonzalez Fletcher said she’s beginning to work on a bill to give rehab projects for affordable housing, which often struggle to get needed loans, access to a state loan fund, making it easier for owners to continue offering affordable rents over the long haul. She’s also researching whether there are opportunities to redefine homelessness in some state programs to ensure families who are doubled up but not considered homeless under traditional federal definitions have ample access to state help. Absent adequate permanent solutions for now, the city’s welcoming hundreds of homeless San Diegans into three temporary tents. In recent weeks, Alpha Project and Veterans Village of San Diego have opened tents in Barrio Logan and Midway. A third tent at Father Joe’s Villages’ campus in East Village is expected to open by the end of this week. They’ll remain open for at least seven months. Faulconer and others have emphasized that the new shelters will focus on helping those who move into them to get quickly into permanent homes. That’s historically been difficult for San Diego’s homeless-serving nonprofits. Data from the Regional Task Force on the Homeless reveals shelters in the city moved just 25 percent of homeless San Diegans who exited them into permanent housing last year. Now city and nonprofit leaders are striving for better outcomes.